It's Photo Friday! This week's photo was taken in Taipei, in the Ximending district. Not far from the metro station is a small Buddhist temple. This one, although being renovated at the time I walked by, was still open and heavily visited, even though it was night. I managed to catch a picture of an old man shuffling out past the person selling flowers. 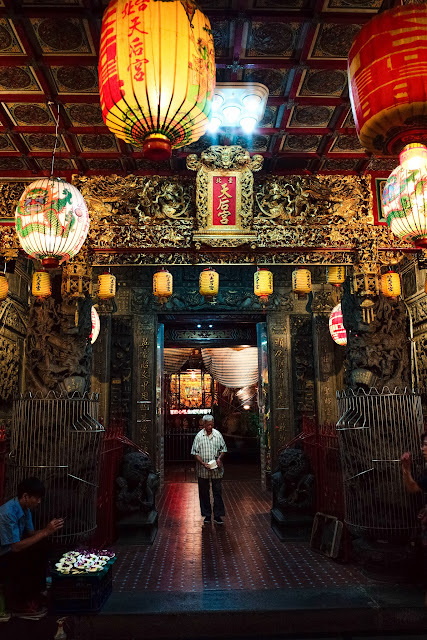 I particularly like how the lights at these Chinese style temples look at night. The quite vibrant and interesting, much more so than when you visit in the daytime.